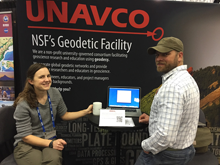 UNAVCO sponsors a variety of meetings and events including our Short Course series, Workshops, Seminars, and sessions at other community events like AGU and GSA. To add the following calendars to your Google calendar, click on the bottom-right +Google Calendar button. Please see the UNAVCO Meeting and Event Code of Conduct page for information on expectations for UNAVCO meeting and event participants. See our 2018 Science Workshop for more information.